Chill Inn is a lovely quaint hostel in a great location, 5 minutes walk from the main road. Why I recommend this hostel over others though, was the incredible staff who were 100% genuine. They gave us awesome tips on where to go and how to get around to save us money and time. In addition to this, each bed in the hostel (which is enclosed with a curtain) has an individual fan, power point, and reading light, and they have an incredible chef who cooks up great food for the free breakfast! Oh and the faucets of the taps are made from real big shells. So that makes it super cool too. 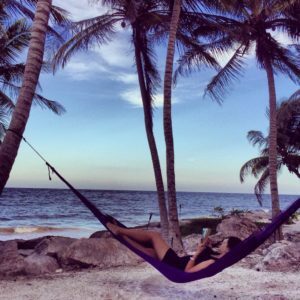 While we were in Tulum, we were invited to stay at Holistika, an incredible retreat offering everything to keep your mind and body healthy. 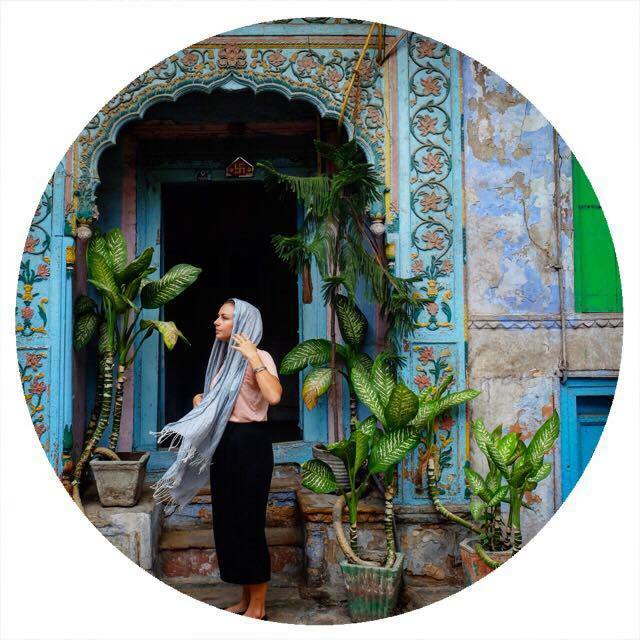 Holistika is a wellness and yoga community which focuses on offering therapies and relaxation to increase your physical and mental health. It was incredible to talk to the owner of this retreat and to hear how passionate he was to give this place everything he can. 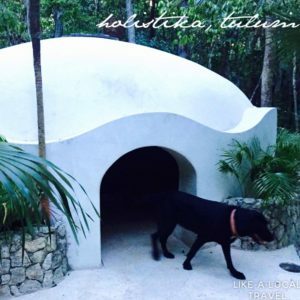 One of the most interesting therapies offered at Holistika was the temazcal, which is an indigenous practice that uses steam to treat physical conditions, as well as to celebrate moments of someones life. Essentially it is a massive pizza oven for people! 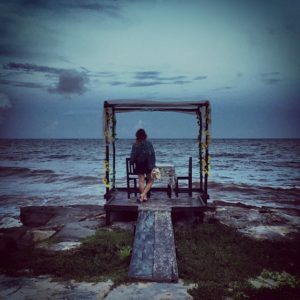 Tulum made me fall in love with Mexican food. No, not like the Mexican food you get in other countries, like serious, healthy goodness flavorful deliciousness. 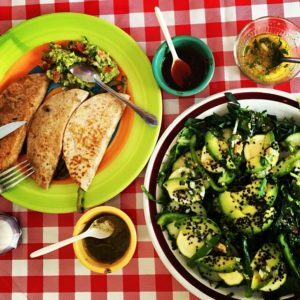 I had this preconceived idea that the food in Mexico would be greasy, choked full of carbs and bland. Boy, I was wrong. So wrong. El Aguacate was another terrific option. The food was so fresh and tasty, we enjoyed every morsel! This little place isn’t fancy, from the plastic chairs to the plastic table clothes, but the food is anything but. Tomales- I’m not a big fan of the tomale, but if you’re looking for a cheap tasty snack or easy dinner, it’s the way to go. Give it a try and see if it’s up your alley! Horchata- YUM! Love this drink. In Mexico, it is usually made with rice (other variations are made with barley or almonds) and always contains delicious cinnamon. Definitely try one! Tacos!- Get rid of that preconceived idea of what a taco should look and taste like, and treat your taste buds to REAL tacos. 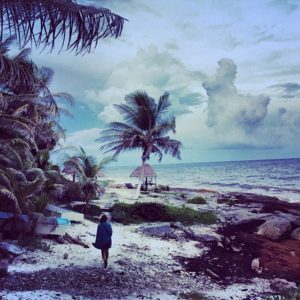 Tulum has the best in the world. There are plenty of beach bars that stretch out along the coast which are perfect for an afternoon beverage while the sun goes down! Papya Playa Project was one we really enjoyed due to the incredible tiered seated area which faces the stunning beach. While they look a lot fancier than a lot of places, they have reasonable prices so we had a lovely dinner here. They also have some great beach parties! The Gran Cenote (also called Grand Cenote) was absolutely incredible and a massive highlight of Tulum. Cenotes are natural pits that develop from limestone collapsing and reveal the ground water underneath. 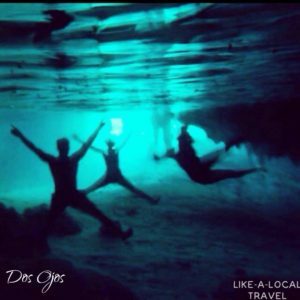 Cenotes are found all over the Yucatan Peninsula and the water is always beautifully pure and clear as it comes from rain water. 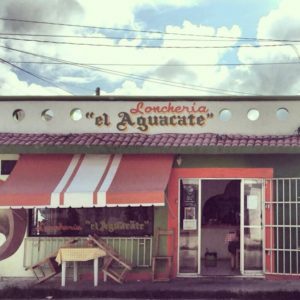 It is located on the highway to Coba just outside Tulum. We opted the cheap way to get there, by catching a Colectivo (find out more about Colectivos at the end oof this post). Unfortunately we missed the turnoff and had to double back, so if you opt for this transport option make sure you tell the driver where you want to get off. You enter the Gran Cenote entrance on the left of the road (the east side away from the coast). When you get in, there is a main building in which you will need to pay an entrance fee (which was approx $10 AUD). We decided to do a cave snorkeling tour, which we really enjoyed. The cave was deep and dark and it was incredible to swim through. Felt very Indiana Jones-ish! After this we were dropped at a swimming hole cenote which was as beautiful as the pictures suggest. We had too much fun here that we missed our ride back to the Gran Cenote entrance, so we started walking with our thumbs on the road! Luckily a lovely Spanish couple picked up my sister and I and gave us a ride all the way back to Tulum since they were heading there anyway. I know, I know, ‘it’s not safe for 2 GIRLS to hitchhike! While yes, sometimes hitchhiking can land you in an uncomfortable or dangerous position, when you are in a park where the only people are tourists and guides, I think you should be alright. We hitchhiked like this a few times in the Yucatan Peninsula and didn’t encounter any problems, just friendly travelers who had hired cars helping us out. 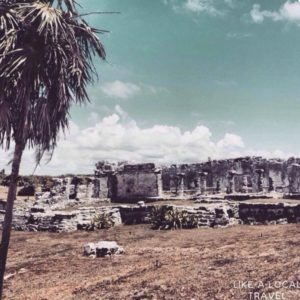 The Tulum Ruins are a great option if you want to see some Mayan ruins as they are right in Tulum on the beach so you can walk there (there are buses, but it wasn’t a far walk). The only Mayan city to be built on the coast, Tulum was once a seaport that traded jade and turquoise (seemingly specialising in rocks that mimicked the beauty of the Caribbean sea it perches on!). The ruins are open 8am to 5pm, and it is almost always rather busy. A less busy ruin that can be visited from Tulum is the Coba Ruins, located north-west of the city. We teamed up with 2 other travelers to rent a taxi for the day to take us to and from the Coba Ruins as this was the cheapest option. After paying the small enterance fee we decided to continue on foot without a guide. Walking through Coba was a great way to spend the morning. It is mostly covered by trees so you are sheltered from the crazy Mexican sun. The most impressive part of the Coba Ruins is the Nohoch Mul Pyramid, which boasts the best views of Coba from 42 metres in the air. Unlike most Mayan ruins, you can climb the Nohoch Mul Pyramid, which gives you an incredible perspective from these ancient ruins. 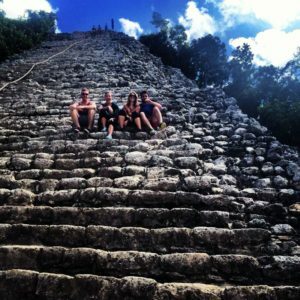 I would highly recommend the Coba Ruins to beat the crowds and get to know more about this incredible culture. underwater cave system that connects two large cenotes. 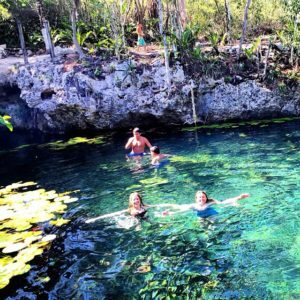 We decided to hire snorkles to explore the cenote which was an incredible experience! After floating around for a while I put on the snorkle and started squealing, I had no idea that the water underneathe me was so deep, clear and full of life!! We found several turtles and heaps of little fishes. At one point I saw a flash of light from way down in the deep and realised it was a group of scuba divers making there way through the cave system! While staying in Tulum, it would be a great idea to rent a bike. This was the best and easiest way to get around the town and to and from the beach! Getting to and fro Tulum: The cheapest way to get around in the Yucatan Peninsula is via Colectivos, which are essentially local mini-vans which run daily. Colectivos are usually crammed and hot, but costing less that $5 to get from Cancun to Tulum? Hell, that’s pretty damn awesome hey. This option may be limited if you are traveling with large luggage, but if you are backpacking like us you’ll get to Tulum with a lot more Peso’s left in your pocket!